Deana S. (Pezzi) Trinitapoli, age 98, passed away peacefully on February 2, 2017, at EastCastle Place, Milwaukee, WI. Deana was born in Irma, WI on June 10, 1918, the oldest daughter born to Luigi and Mary (Pasta) Pezzi. Deana was raised on the family farm in Irma along with five brothers and three sisters. She learned all things Italian from her very proud immigrant parents and neighbors. 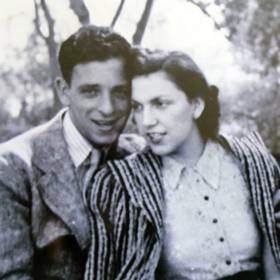 After high school she moved to Milwaukee and married Oreste “Rusty” Trinitapoli on May 25, 1940. She quickly became a beloved part of the Brady Street Italian community and lived happily among extended family and friends. Her life’s work was raising her two sons, John and Richard. She became very involved with their athletic careers attending football and basketball games every week. 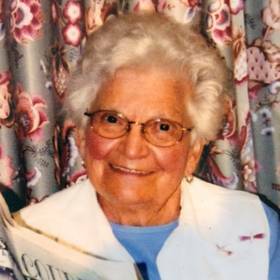 She was passionate about local sporting teams to the point of knowing the starting line-ups for the Packers and the averages/eras of the Milwaukee Braves and the Milwaukee Brewers. Deana enjoyed her time spent working for the State of Wisconsin in the apprenticeship division but that did not interfere with the daily cocktail hour she shared with Rusty. Deana started many traditions that are carried on today. Her cookie jar was always filled with pizzelle and biscotti and the Thanksgiving raviolis are a staple in many of our homes. There was nothing better than walking into her house on the day she was making pasta sauce! She will be remembered for many things, but mostly for her loyalty, dedication and love she had for her family. Later in life Deana enjoyed and loved her six grandchildren. She was blessed to know many of her nine great-grandchildren--a few of which she babysat until she was 90 years old! There are also numerous nieces and nephews that will miss this loving and caring lady. The family thanks all who were involved in her care, especially to the third floor Memory Assistance unit at EastCastle Place. Deana was preceded in death by her beloved husband Oreste “Rusty” Trinitapoli. She is survived by her two sons, John (Sue) Trinitapoli and Richard Trinitapoli, her adoring grandchildren Elizabeth, Anna, Gianna, Jenny, Mark and Michael. her dear sister Lydia Bauman. Deana is further survived by 9 great-grandchildren, nieces, nephews, other relatives and friends. Visitation Monday, February 13, 2017 at Three Holy Women Parish – St. Rita Church 1601 N. Cass Street Milwaukee, WI from 10:00 AM until time of the Funeral Mass at 11:00 AM. Private Interment Holy Cross Cemetery. In lieu of flowers memorials to Three Holy Women Legacy Fund appreciated.